Home › News › 12 Gorgeous Flower-Shaped Recipes & Desserts for Springtime - The Flower Cupcakes are Crazy! 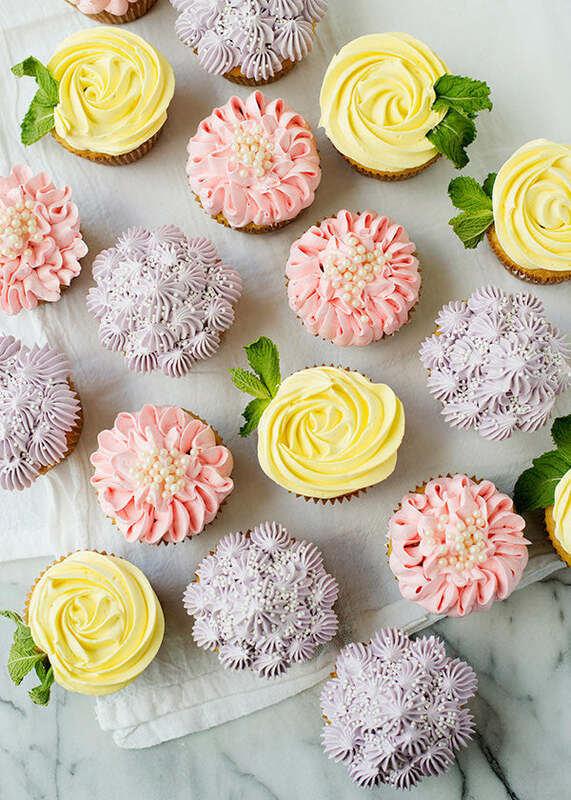 12 Gorgeous Flower-Shaped Recipes & Desserts for Springtime - The Flower Cupcakes are Crazy! April showers bring May flowers. We all know that famous rhyme. Now let's flip that script, because April showers are not the only things bringing killer flower recipes and desserts. Now YOU are too! 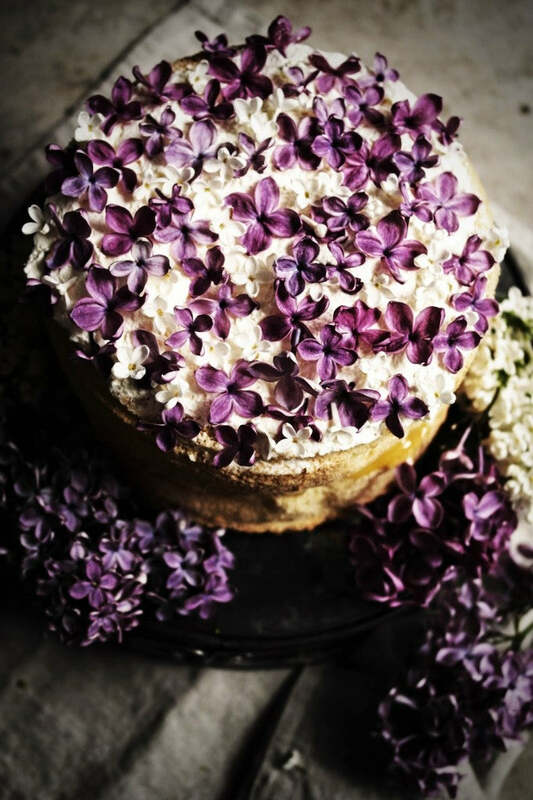 Let's celebrate the blossoming flowers of spring with some beautiful flower-shaped desserts and/or recipes made with REAL flowers - both sweet and savory treats. Some foods can be made to look like flowers. Others, are actually edible flowers straight from the ground! These lollipops are so elegant and beautiful. They'd be stunning for a bridal shower, sold at a craft fair, or given away in individual wrappers as party favors. Plus, they're pretty easy to make! 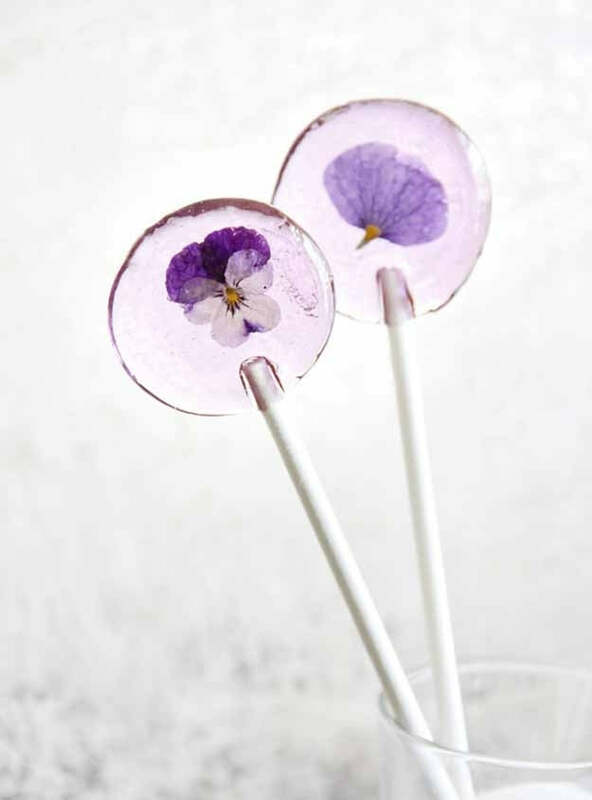 All you'll need are the edible flowers, sugar, and some sticks. Follow the recipe below and experiment by adding other edible fauna to the centers of these pops too for another pop of good taste. If you need some fast and don't have time to make them yourself, try these lovely Flower Twinkle Pops. This is one elegant appetizer-or side to a refreshing main course dish. 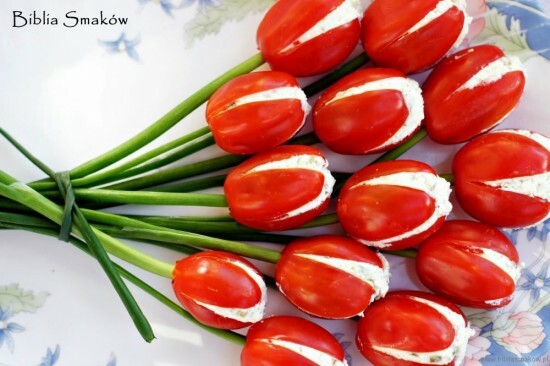 These cheese-stuffed tomato tulips are so lovely, inventive, and yummy. Arrange them on a platter like so, and you'll have a perfect dish to make your guests say "wow!" If you plan on plating food before it hits the table, you can place one of these faux flowers on a plate too and it'll look just as lovely. 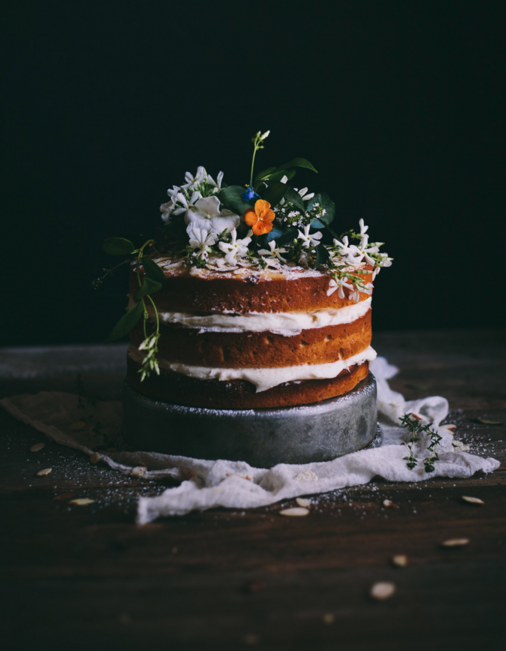 We just couldn't pass this amazing recipe up as we celebrating the blooming flowers outside and had a feeling you wouldn't be able to either! Showstopper after showstopper. 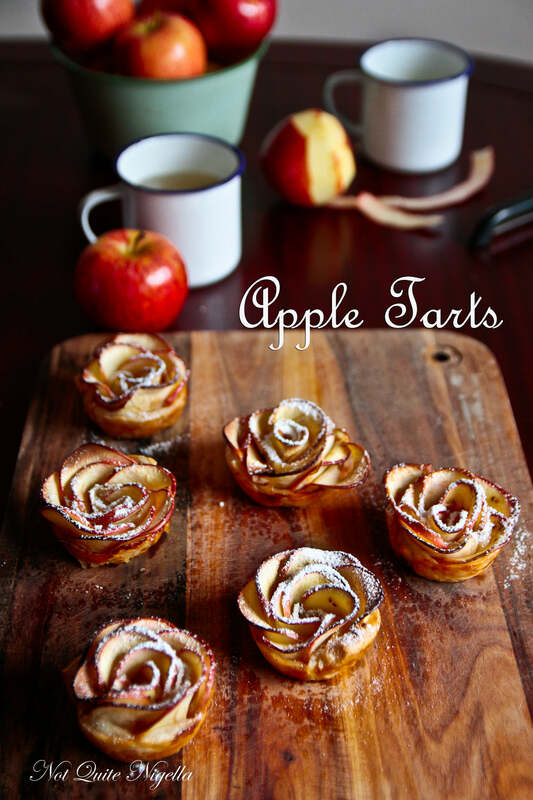 This third recipe for you looks like a cottage rose, but it's actually an apple tart! With some culinary genius and skills with a knife, you too can create these gorgeous flower tarts in your kitchen. Put these on a plate with a line of green-tinted caramel for a stem and leaves or place them on top of a delicate doily for a shabby chic and rustic look. Served alongside a cup of cinnamon tea or hot cocoa, they're seriously amazing. Just make sure to take a photo before you dig in so you can show off your skills in the kitchen! My, oh my. This could be a wedding cake it's so effortlessly chic. Using edible flowers on top will provide a show for your eyes and your taste buds. Keep this cake simple by just adding frosting between the layers and to the top and arranging the flowers directly on top of the cake. Since cake is so soft, it's a perfect stand-in for florist foam and will be the best "vase" for your flowers before you eat them. Display this on a concrete slab like so or inside a clear cake dome. Having a tea party this spring? 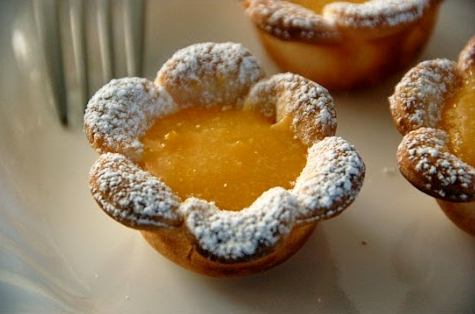 You simply must make these lemon flower tarts. With lemon curd on the inside, powdered sugar on the outside, and a buttery cookie holding it all together, it's a delicate and decadent treat. 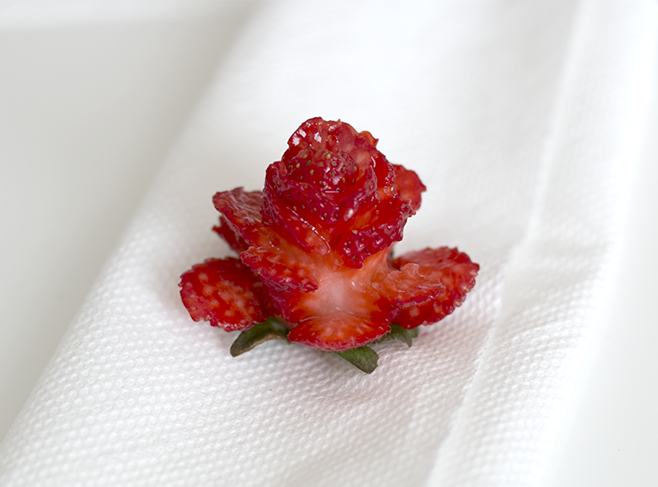 Plus, it's shaped like a flower so it fits into spring menus so well! Group some of these beautiful flower lemon tarts on a tiered platter for your guests to enjoy alongside tea and coffee. It's a recipe you're sure to get many compliments for. Deliciousness is in full bloom with this next treat. These flower cupcakes are absolutely breathtaking with their natural beauty. If you have a piping bag for frosting, you'll be set. Make any cupcake recipe you want or follow the directions on the link below. Then, make sure you divide your white icing up into different bowls so you can dye it a variety of colors and create your edible bouquet. Pick up some edible sprinkles that look like pearls for the centers and you'll be in beautiful business. Here's a savory version of normally sweet flowers. 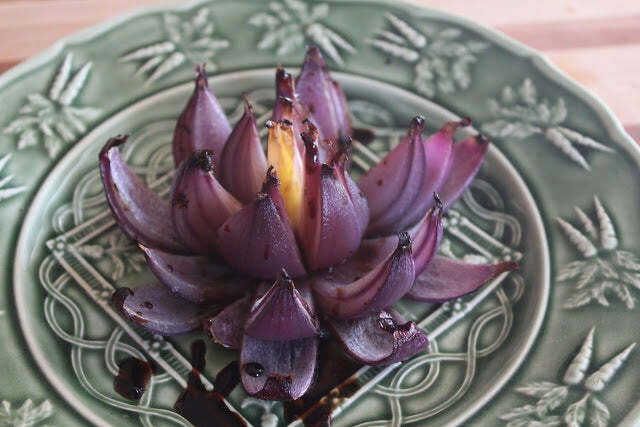 This roasted onion flower is so pretty and tasty too. It would make a stunning first course if you're having a fancy dinner party this spring or even look pretty as a garnish on top of a piece of fish or salad. It's the healthy version of the "blooming onion" and shows off the gorgeous purple hues a red onion takes on when roasted. 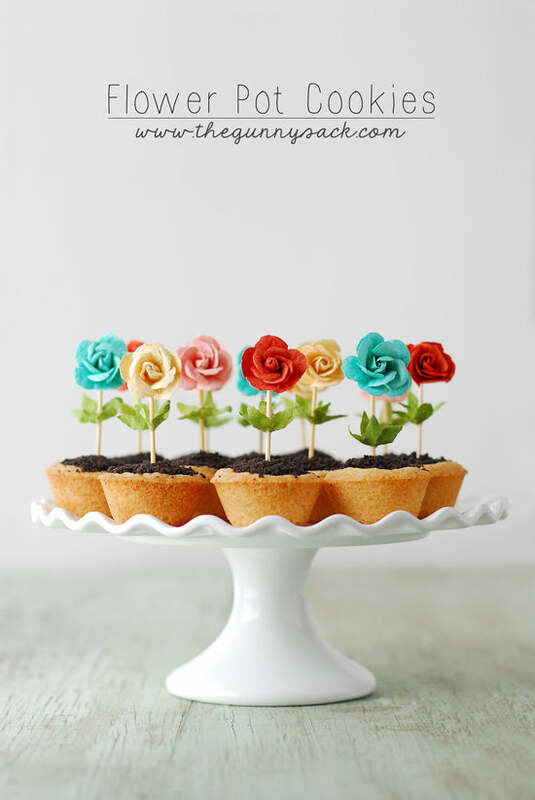 Grow something great in the kitchen: these flower pot cookies! Disguise a plain vanilla cookie to look like a flower pot by sprinkling some crushed Oreo or brown sprinkles on top and then follow the directions for the inedible flowers. If you're feeling really adventurous, you could absolutely make edible flowers for the top. It would just be one more step, but it would totally add a lot of tastiness to this confection! Did you know that lilacs are edible? They are! They smell and look lovely too. If you have a lilac tree growing in your back yard, you're in luck. Just go outside and snip off a bunch or two and strip the flowers from the stems. Scatter them like this person did on a frosted white cake and you'll have a simple and elegant wedding cake, bridal shower dessert, or birthday party treat. It's almost too lovely to eat. You can adapt this recipe to cupcakes and frosted cookies as well. Even sprinkle some lilacs on top of a mixed drink for an unexpected and yummy surprise. Dandelions are considered to be weeds, but their greens and nectar can be used to make all sorts of goodies! 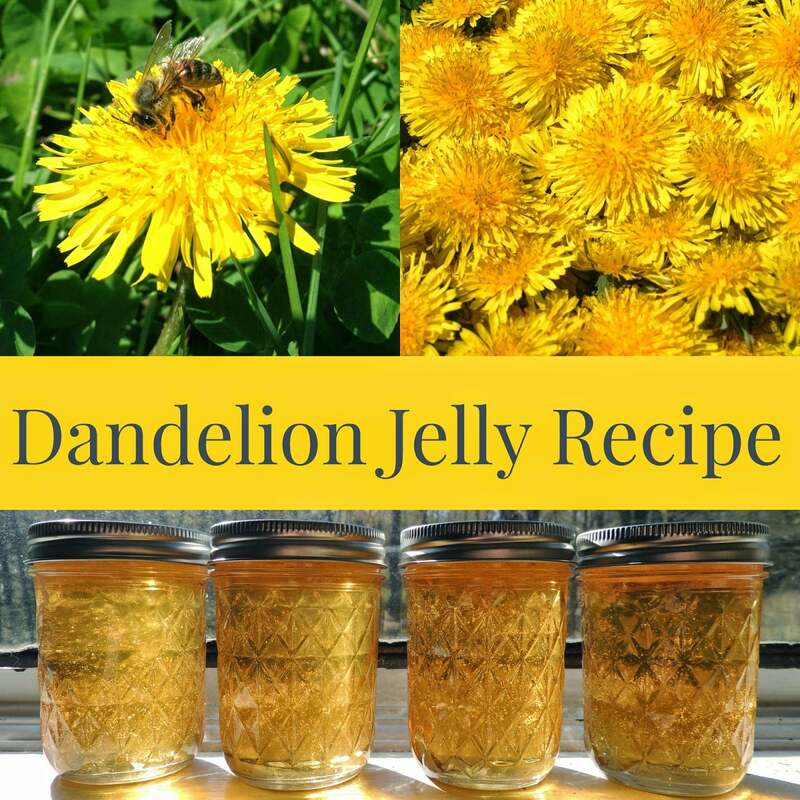 Instead of spraying them with harsh chemicals, pluck them from your front yard and get ready to make this sweet dandelion jelly. If you know how to can, it's a plus since you'll be able to save some jars to last you throughout the year. If you don't, now's a great time to learn! You can just make a small batch to use up right away too if you'd prefer. Just do as the bees do and start enjoying this bright yellow and delicious flower. Depending on where you live, you might be able to head out to the strawberry patch and pick your own for this beautiful floral treat. If not, the store should be overflowing with bright red berries you can experiment with. After all, you'll only need a carton or two of strawberries and a sharp knife for this treat. You'll need to follow the directions on this one to get it right, but just cut carefully and before you know it, you'll have beautiful faux flowers to enjoy. 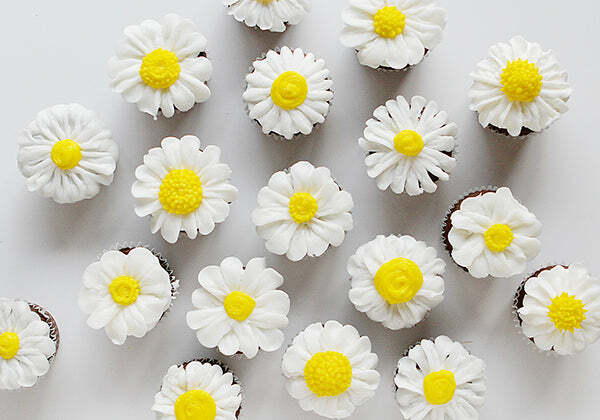 Our final flower-inspired treat is a daisy cupcake recipe. With bright white and yellow icing that's piped in the shape of petals and pollen, it's one of the most cheerful desserts we've seen in a while. You can also follow this recipe word-for-word, or choose one you love most. The really important part here is in the icing, so just make sure you have a piping bag and different shaped tips to achieve this delicate and decadent look. You can even steal this daisy idea and decorate the top of a cake for a bridal or baby shower. It's pretty enough for practically any occasion. And you can heighten the display with some gorgeous daisy pops.